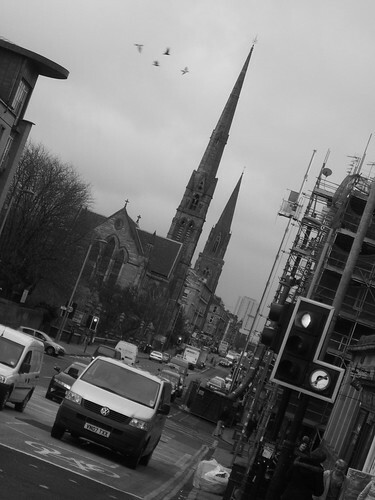 This is a view down the Great Western Road looking towards the direction of the city centre, showing first Lansdowne Parish Church and further away St Mary’s Episcopal Cathedral. Beanscene is a chain of coffee shops which has branches in Glasgow, Edinburgh, Ayr and I guess other places in Scotland too (I’ve never seen them in England, but they’re all over Glasgow and I’ve been to at least one in Edinburgh too). I guess like a Scottish Starbucks. 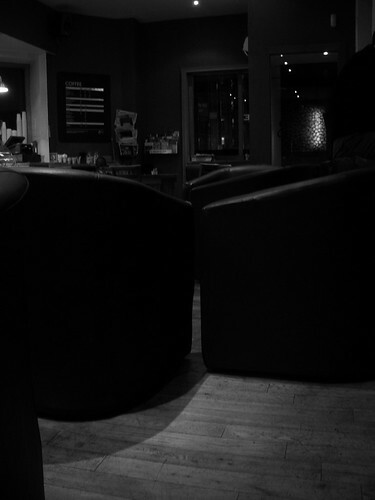 They all have these same comfy chairs (very comfy they are too) and do food as well as coffee. I like them – depending on the location they can be very relaxed (although the one nearest to Glasgow University has a bit of a reputation of being where all the yummy mummies hang out – at lunchtime you have to practically climb over the prams to get to your table). This one is in the Battlefield Branch, near the Victoria Hospital. The coat of arms that gets everywhere! One day I’ll have to tag all my photos, so I can find the various ones that show the elements of Glasgow’s coat of arms. 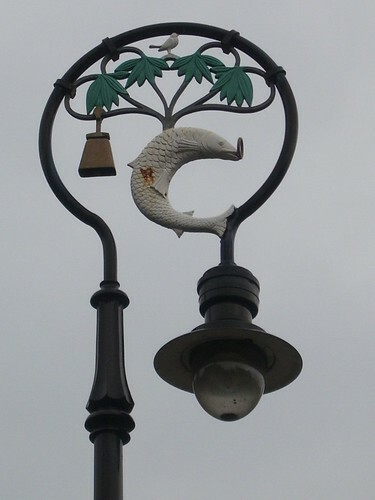 Here it is again, this time as part of a street lamp in Cathedral Square. Here is a link to the story of the coat of arms, for those who are newer to the blog (and to Glasgow!). 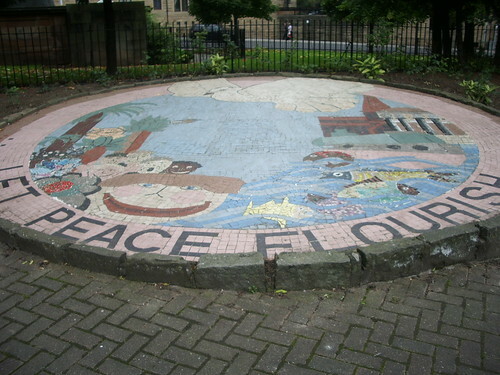 This mosaic, with its play on words (Glasgow’s motto is “Let Glasgow Flourish”) can be found brightening up Cathedral Square. 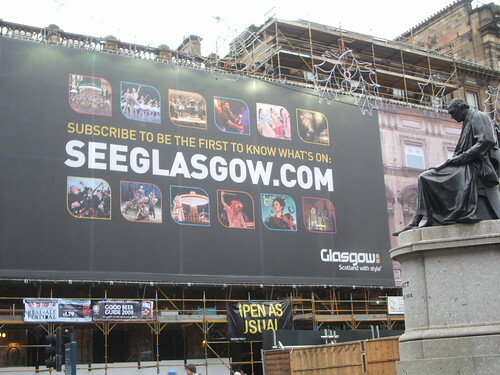 This advertising hoarding, covering some scaffolding in George Square, is advertising “the official site for Metropolitan Glasgow”, seeglasgow.com – probably a site worth checking out if you are planning a trip here. You can perhaps just see the bells and holly Christmas lights in front of it. Winterfest? Good grief, it’s political correctness gone mad! It’s CHRISTMAS!! Harrumph. Since I took this picture in George Square last week, they have opened up the square (it was closed at this time as they were still building all the festive bits and bobs) and added a big carousel which would be in the foreground of this picture. I’ve got some pictures from the evening with the lights in all their glory which I’ll probably start sharing with you next week*, but I’ll try and get back this week too so you can see everything that’s going on in the square. 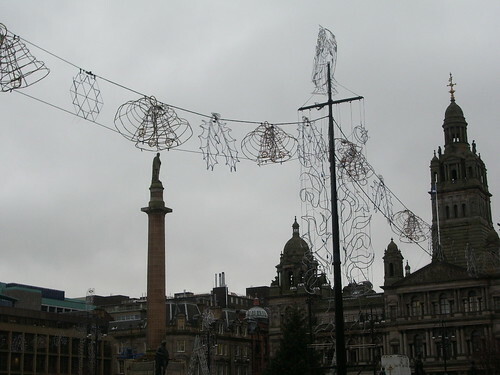 These lights surround the square on 3 sides and are the same every year – it wouldn’t be a George Square Christmas without the bells and holly. * Next week is December (eek, how did that happen?!) 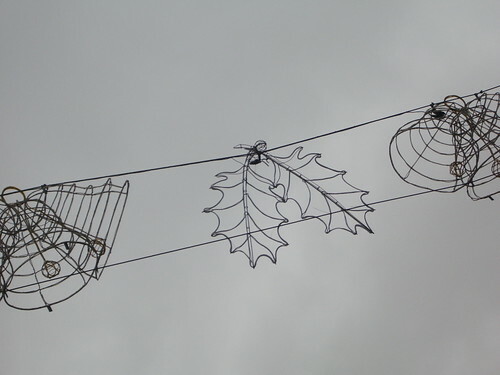 so I’ll feel less curmudgeonly about posting Christmas light photos! The other day Marley at Cheltenham DP showed a picture of the Christmas market. Only a couple of days before I’d taken this picture in Argyle Street, where as you can see the market is still a work-in-progress. It’s looking like it will be up and running soon though. The stall with the bell tower (how grand!) 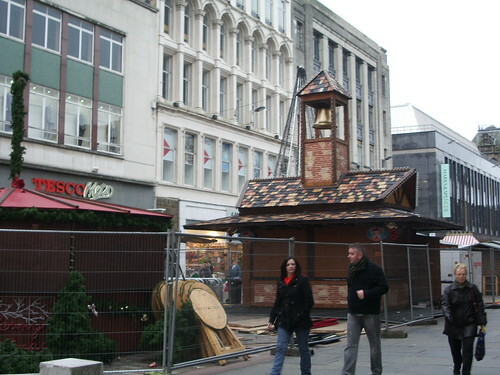 is I think going to be a German sausage stall. The Q! 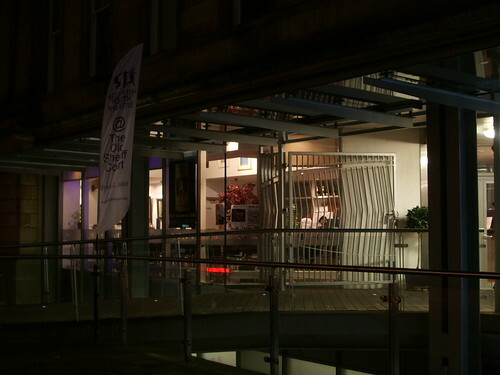 Gallery is on Saltmarket in the Merchant City. As well as a gallery it also has some studio space. It is currently (until 10th December) showing an Amnesty International exhibition of photos from the Gay Pride march in Riga, Latvia earlier this year, documenting the parade and the opposition it attracted. It’s well worth a visit if you’re in the area. More information on the exhibition is here.